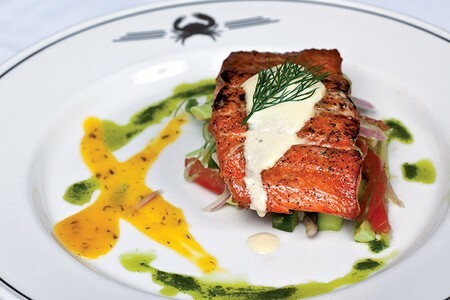 Truluck’s, nestled in University City, is always fresh on the dining scene with an edge not many can counter. Renowned for their seafood, they operate a crabbing fleet of no less than sixteen boats off the coast of Naples, Florida. 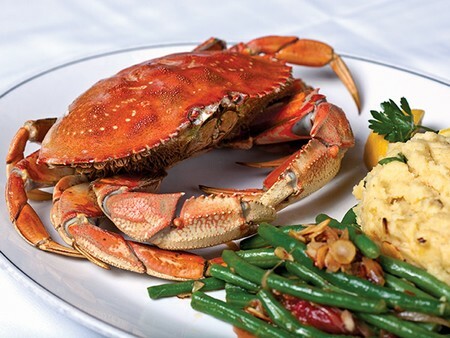 Armed with this advantage, the crab is delivered fresh to your table within twenty-four hours of being caught. Those searching for an alternative to seafood can choose from a selection of seven steaks and chops roasted or grilled to a level of precision unmatched by most steakhouses. For recreational wine drinkers or connoisseurs alike, Truluck’s offers a hundred wines by the sampling, the glass, and the bottle. Upon entering Truluck’s, one can’t help but be drawn to a large tank full of live crabs and lobsters in the reception area. 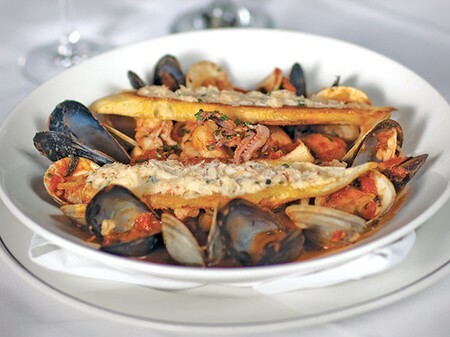 Renowned for their dedication to the freshest seafood, this Texas chain operates a flotilla of sixteen crabbing boats off the coast of Naples, Florida. 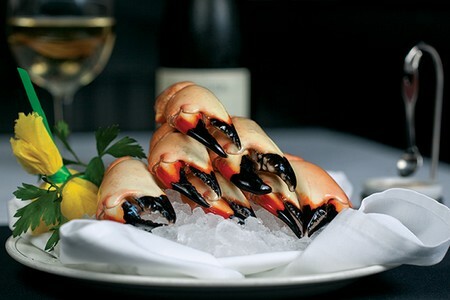 Eyeing a reticent stone crab, one can’t help but feel a pang knowing that not twenty-four hours before, he was roaming boundlessly in the Atlantic. As it stands, this evening his loss will be my gain. The dining room, a large open space cloaked in sweeping shadows, has an understated elegance that instantly renders one at ease. A throwback to older East Coast seafood restaurants, luxurious ruby-red leather booths line the walls and congregate in clusters throughout the room. 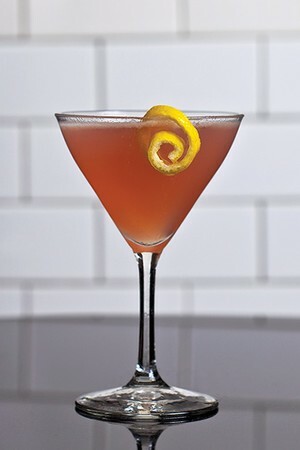 A skilled jazz instrumentalist sits back behind a grand piano near the bar, crooning disarmingly to fill the lulls in conversation among diners and bar revelers alike. This extra touch creates a soft atmosphere conducive to the unhurried comfort that Truluck's captures in both their ambiance and décor. Stunning in its stark tranquility, a large Marlin adorns the wall directly adjacent to our table, while over every open surface, submerged pink orchids twist lazily in tall cylindrical vases, providing warm splashes of color to the unfussy décor. The wine list, another point of pride for the famed establishment, is impressively presented between the bar and dining room in a temperature controlled glassed-in vault for all to see. Our meal commences on what I can only deem a positive note, as both items contain the word “tower”: the Chilled Seafood Tower, customized with fresh Maine Jonah crab claws and oysters, and the Tuna Tartar Tower with a side of shrimp chips for dipping. The seafood tower is an impressive spectacle to behold; a plate lined with crushed ice sits on a raised metal stand with smoke from dry ice billowing down entrancingly. The oysters, not usually one of my favorite mollusks, are tender and cool, and well paired with a light champagne mignonette and a flute of the Piper Heidsieck Champagne. The crab claws, partially cracked but still in their shell for the true “crab-eating experience”, are fantastically coupled with a tangy cream-based sauce with smooth hints of mustard and horseradish. 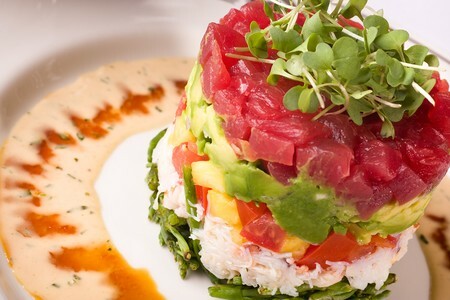 The tuna tartar tower, looming five layers tall, is a vibrant arrangement of sea beans, crab, tomato salsa, avocado, and fleshy raw tuna. 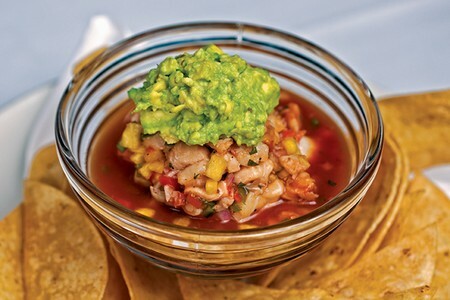 Plunging a shrimp chip generously through the rainbow of ingredients, I find a childish delight in the crackle ‘n pop that emanates from the tuna on the chip’s porous surface. Both “towers” are testimony to Truluck’s commitment to freshness. Highly pleased with our appetizers thus far, we opt to stay on the first course and order the Sautéed Superlump Crabcake, the Brazilian Pacu Fish Ribs, and the Warm Goat Cheese. Before the crabcake arrives, our enlightened server, Robert, informs us that it is 92% crabmeat. The wine pairings, a fruity Sauvignon Blanc from New Zealand, and a crisp Grüner Veltliner from Austria, showcase a small fraction of the hundred wines by the sampling, the glass, and the bottle that makes Truluck’s such a well-rounded establishment for recreational wine drinkers and connoisseurs alike. When the jumbo crabcake descends upon our table, our jaws drop at the sheer mass of it. Resting on a creamy sauce packed with fresh herbs, the golden-brown orb is an indulgence in crab to rival the previous Jonah crab claws. Unencumbered by stuffing, the fresh white meat's flavor radiates alongside a zesty, herb infused sauce. The Brazilian Pacu Fish Ribs resemble a glazed cross between fish sticks and ribs, and produce a heady scent of barbeque and island fruit that has me nearly overlooking the two thin bones holding the flavor-packed meat together. Grilled watermelon triangles dangle daintily over a simple slaw. The Warm Goat Cheese appetizer, a change from our steady stream of seafood, demonstrates that chef Nathan Boothe has culinary depth that reaches well beyond the sea’s bounty. Two toasted pieces of crostini lie over a generous lump of goat cheese scattered with olives, sweet chilies, and spiced pecans. A testament to flavor, the tartness of the creamy cheese is a lovely contrast to the nutty sweetness of the pecans, the brininess of the olives, and the spiciness of the chilies. Our culinary revelry is continued with the Lobster and Leek Soup and the Hot-House Tomato Salad. The soup appears in the deceptive form of an empty bowl with a few pieces of ripe lobster meat drizzled among crème fraiche and caviar. A moment later, Robert expertly pours a stream of steaming soup into our bowls from a dainty silver tureen, plunging the lobster out of view and causing the crème fraiche to form swirling patterns across a hearty pea-colored base. The soup itself is light and creamy while the lobster, crème fraiche, and caviar add a rich and salty impact that sends waves of bliss surging down my throat. The Hot-House Salad is a sight to behold; a halved tomato is fully submerged by buttermilk dressing, Parmesan shavings, dill, shaved red onion, and Applewood smoked bacon. The creamy heaviness of the dressing and its accompanying ingredients is complemented by the freshness of the tomato in an ingenious pairing. Despite its devotion to the surf, Truluck’s also pays homage to turf with a selection of steaks and chops. The Filet of Beef Oscar, a 5 oz. cut topped with fresh Maine Peekytoe crab, shaved asparagus, jalapeno Béarnaise, and a side of Parmesan mashed potatoes, is truly a study in the art of grilling. Paired with an elegant 2005 Viader Syrah, my knife slices through the buttery pink portion effortlessly. The succulent morsel all but melts in my mouth alongside the smooth, rich jalapeno Béarnaise. 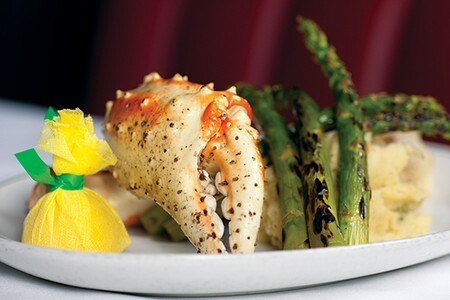 Not to be outdone, the asparagus and crab provide a healthy yet creative seafood alternative as a side. Next up is the South African Cold Water Lobster Tail, better known to the seafood aficionados as “the Rolls Royce of lobster”. The open-faced tail is drizzled with a simple yet savory lemon and garlic butter. The classy crustacean proves to be sweet and tender, with a butter that doesn’t detract from the meat’s velvety smooth texture and overall freshness. A side of seasoned Parmesan mashed potatoes whipped up to precision alongside some not-too-firm and not-too-soft grilled asparagus complete the dish. The King Crab Macaroni and Cheese, one of Truluck’s dozen or so side options, proves impossible to resist. A medley of baked cheeses made with a rich buttery roux back my long held theory that there’s more to macaroni and cheese than noodles, butter, processed powdered cheese, and milk. With a generous splaying of thick chunks of crab mingling amid penne steeped in full-flavored cheeses, it’s an instant hit at the table. Alongside our next entrée, the Dutch Harbor Red King Crab, it’s the sort of epicurean experience gourmands like myself only dream about. My first encounter with a crab this large, I approach the creature with an intimidation I wouldn't normally associate with food. Apprehension proves unnecessary: the crabmeat abundantly pours out of its shell, helping me avoid the sort of catapulting crab debacles that would normally ensue for me in this situation. Dipped in the same lemon-garlic butter as the lobster, it is chunky and tender, the flavors harmonizing in the most succulent of ways. The pièce de résistance comes in the form of a two-person serving of the three-layer carrot cake. Awarded Best Carrot Cake in both Florida and Texas, where the Truluck’s chain reigns supreme over quality seafood, it more than delivers in both taste and presentation. A thin drizzle of warm butterscotch syrup gracefully poured in front of us by Robert has our eyes glazing and our mouths watering in anticipation. Not dense like most cakes of its kind, this sinful treat boasts a light, fluffy cream cheese frosting and a generous helping of candied pecans over a moist and spice enriched cake. 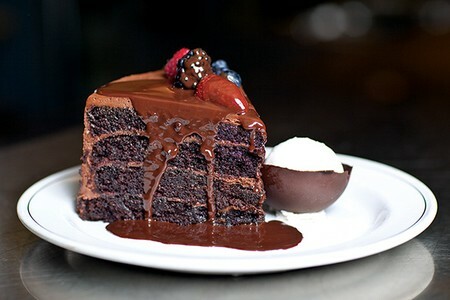 The Dark Chocolate Cake, equal in silhouette and magnitude yet not as sweeping in flavor as the carrot cake, is not for the faint of stomach. All three layers of the rich cake are robed in a ganache of the finest quality milk chocolate and topped with a bouquet of wild berries. The fresh fruit combined with a scoop of the purest vanilla ice cream offset the richness of the cake in both taste and temperature to create a seductive mingling of the senses. Thanks to the two-person servings of both these delicious desserts, we find ourselves up to our ears in leftovers, and marvel at the idea of dessert for breakfast after our stomachs have had a night of repose to recover. Reluctant to leave, but just as eager to burrow into a well-deserved food coma, we inch our way out of the booth and into the crisp night air. As we take in our surroundings, we notice that the outdoor patio has filled up with a few tables. Heat lamps and fire pits alike keep guests protected from that San Diego coastal chill. Surpassingly satisfied with both the surf and the turf, we go home with smiles on our face over the recent memory of our culinary indulgence, as well as the promise of leftovers in the morning. 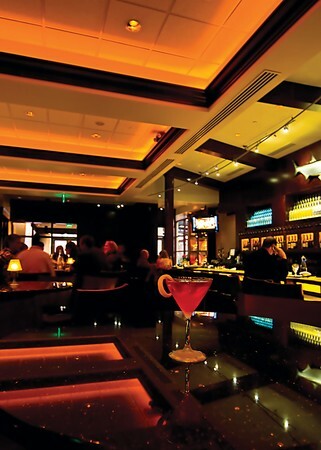 Stone Crab Lounge | Happy Hours 4:30 p.m. - 6:30 p.m.
What nights do you offer live music? What time does your lounge open? What are your happy hours? Do you have soft shell crab? Does your restaurant have an ocean view? No, Trulcuk's is located on University Lane and Lebon Drive about 3 miles from the beach. what is the usual attire for friday evenings? All of Truluck's menu items are trans-fat free. This is a sample menu only. Prices and availability may be subject to change. Join us for our fabulous Cocktail Hour from 4:30 - 6:30 pm daily. Enjoy Half-Price Cocktails, Featured Wines, and Selected Appetizers. Sit, Sip, Relax! This is a sample menu only. Prices and availability may be subject to change. My boyfriend and I were celebrating our second year anniversary and we wanted to find a “different” restaurant that would make our special truly memorable. I researched on the internet and finally found a site that provided a detailed description and ratings of all the restaurants in the San Diego area. One place caught my attention because it rated consistently high in all aspects. I made a booking through Sandiegorestaurants.com and I was amazed at the prompt response via email confirming our reservations at 7:30 PM. I specifically wrote that I wanted a small private nook because we were celebrating our anniversary. We were able to locate the place quickly and were greeted cordially by the valet attendants upon our entrance. Parking was very important to us and this place did not have that problem at all. The restaurant was very cozy and the interiors were tastefully done (well, except for those fishes hanging on the wall, which my BF found quite tacky, considering the opulent atmosphere). It was a mixture of warm ambiance with a subtle touch of elegance. It wasn't anything snobbish or pretentious). Our server was so warm and intelligent (it made us both wonder if she had a PhD tucked under her sleeves). She explained to us how the restaurant got its name (from a horse) and worked with us patiently in choosing our orders. My BF ordered halibut while I ordered deep fried jumbo shrimps and red wine tasting which consisted of 4 varieties. The servings were “ample”, the taste was nothing extraordinary (I found the halibut quite dry); the prices, fair. What literally floored us was when our chirpy waitress surprised us with a cake and a personalized card signed by her and the manager. That was indeed very thoughtful. Towards the end, the manager came to our table and asked if we enjoyed our food and gave us his calling card. That was the second time that we were given a calling card, the first, being our waitress. My BF and I both felt that we were treated like royalties and the service was highly personalized that our evening went by without a hitch. 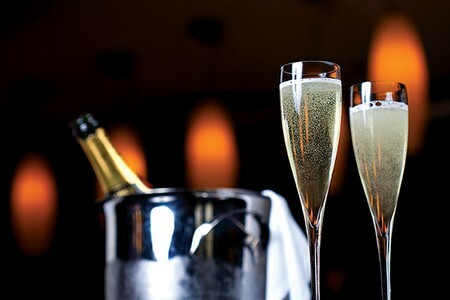 We would both recommend it for special occasions such as anniversaries and birthdays. The food was outstanding! The service was excellent. Nice romantic setting. It was the perfect start to our Valentines Night!! The dimmed lighting & soft live performance enhanced our experiance. Look forward to returning soon. My wife and I came for dinner on February 13 to celebrate Valentine's day. I had read other reviews on-line and found them to be accurate--excellent food and service but a bit noisy. We will definitely return--if for nothing else, the carrot cake! We were not able to get our table on time because the other large parties that had come before us decided to sit and chat for several hours. The restaurant manager or owner (not sure) made up for it completely, however. They offered their private room (which we declined) and gave our party a free round of cocktails, as well as several complimentary appetizers (oysters, shrimp, crab claws) ready for us as we sat down. The waiter gave an excellent suggestion for wine, which complemented our meal very well. The entire meal was fantastic, and it was possibly the best seafood I've ever had. Enjoyed the king crab legs and the wonderful service! Visit Truluck's, we were celebrating a birthday, everything went great. From the time we entered the establishment until the time we left...If you want a relaxing atmosphere, with piano music this is it !! The food was everything we expected it to be, along with the outstanding service we had. It is expensive, but if you want a unique dinning experience this is the place to go. We had a very enjoyable dinner, we have no complaints. A excellent restaurant to enjoy good food! The king crab legs were the best I've ever had! Our waiter provided excellent service. The food, the service, the beautiful ambience makes this one of my favorite restaurants in San Diego! Best dining experience in YEARS!!! My boyfriend and I wanted to try a new restaurant so I googled "seafood" and voila - Trulucks. I made online reservations which were confirmed within 3 minutes! We showed up early and were promptly seated. The booths are all pretty secluded, great date night place! For my app I got the tuna tartar which was to DIE FOR!!! I ordered the swordfish with bernaise sauce (crab/asparagus in it) for dinner and OMG!!! My boyfriend got the crab (pacific northwest dungenous I believe) and said it was "the best crab" he'd ever had. The wine pairings were FAB! We were so impressed and I have been tooted Trulucks horn ever since :) We will definitely be back! Thank you Tanner and Trulcuks for a wonderful experience all around! My husband found this restaurant by searching for restaurants online for our Anniversary. He checked with some native Sandiegans, and they noted that this was a great restaurant...the seafood was really fresh and good. If you are a crab lover, you will definitely enjoy this spot, we found that we got alot for our money! The bar drinks were really good too! we had a wonderful birthday celebration dinner at Truluck's... from beginning to end, the service and food was superb... we live in L.A., but will visit Truluck again when we are in S. D.
We went to Trulucks expecting a delicious meal of fresh seafood and great service. Instead, I can only describe the service as exceptional, and remarkably, the food was even better. The crab was beyond fresh, prepared exquisitely, served expertly and we enjoyed it immensely not just for dinner but for breakfast the next morning. 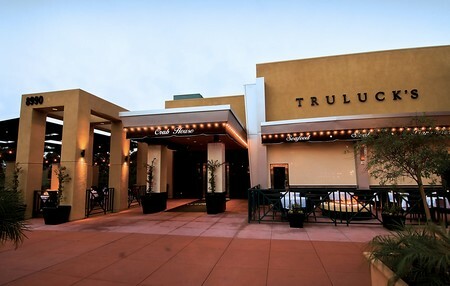 Thank you, Trulucks for one of our favorite dining experinces to date! Great experience. Service was excellent, attentive, but not disruptive. Food was excellent and fresh with a great presentation. Piano in the backgroud was really nice and enjoyable. Pricy but worth it for special occations. My wife and I really enjoyed the evening. We had a wonderful time. The food was excellent and the service was first class. We would definitely recommend this place and we will definitely return. The restaurant is beautiful and surprisingly low key for a Saturday night. There is a variety of seafood to choose from. If you plan not to eat seafood or are allergic your choices are limited. Nonetheless, delicious. The service, helpful and polite. We didn't feel hounded or asked every 5 mins a question. It feels so plesant to be left alone and have a quiet delicious dinner. We have enjoyed our meals both times we've been there. Also, love the uncrowded location. Try it. You won't be disappointed. We weren't. Excellent service. Excellent seafood. A really great filet. Carrot cake was insanely good. I made this reservation for my wife's birthday. After our meal and before dessert was ordered the waitress presented us with a complimentary carrot cake cupcake and chocolate malt cupcake on a specially prepared plate. Both desserts were outstanding. They also gave her a birthday card signed by the restaurant staff. The next day a representative of the restaurant called to ensure that our experience was acceptable. I have rarely had a business make us feel so appreciated. 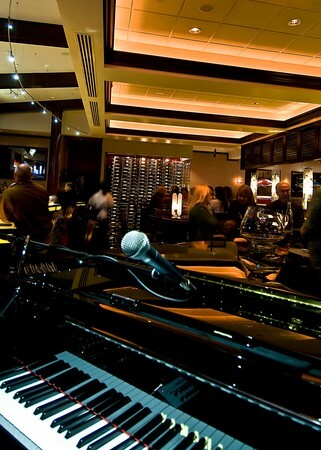 When we walked into Truluck's the live piano set the tone for a fabulous evening. Wonderful! The salads were fresh and a good portion. All 6 of us tried different items. 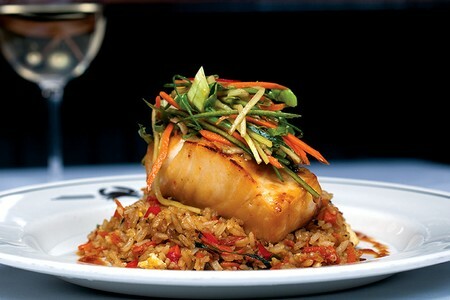 Everything was outstanding...The seabass won our vote( hands down)..It id s must try. Dessert ; The carrot cake was from another planet !! Plan your meal around it. My husband who doesn't really care for carrot cake said it was the BEST carrot cake he has ever had! It has nuts which I don't normally go for , but there is something MAJIC in the recipe that leaves you talking about it . We dined at Truluck's to celebrate our 30th wedding anniversary. We were looking for seafood on the internet, and liked the look of the menu selection and the pricing. We had never heard of the restaurant before and were very pleasantly surprised. Everything was quite delicious. We loved the starter called Tuna Tartar Tower - it was incredible. We received excellent service. We would recommend this restaurant to all our friends. My fiance and I took a 3 day excursion to San Diego, and I picked out Truluck for dinner one night. The entrance of the restaurant had nice lighting and a nice entrance way. Inside the front door we saw a display of fresh seafood, which made us more hungry! The lighting inside was really nice, dimly lit, with live piano music. The service was excellent and the food tasted good. I would recommend this restaurant to others. 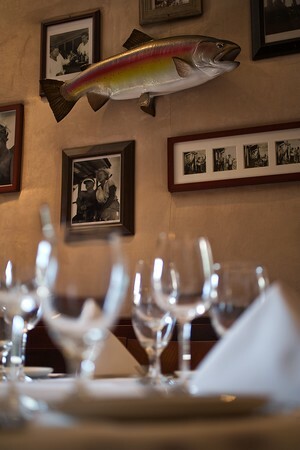 Finally a premium Seafood restaurant that has great wine selections by the glass in San Diego. A restaurant where the owner speaks to you and carries out a conversation where his passion reveals his love to provide a first class dinning experience. FANTASTIC - we loved this place. We loved almost everything about Trulucks! The parking was made so easy, having a cocktail at the piano bar, our very private seating, the excellent service and advice from our waiter, the wine was great, the FOOD was fantastic! An incredible overall evening for my wife and I on our anniversary. Very romantic. The food was very good, however the deserts are fantastic! Seafood tower was excellent -- jumbo shrimp! We don't like oysters, but Truluck staff was willing to substitue more shrimp and crab instead. Worth every penny. Red King Crab legs were the best we ever had, and the chiopino was wonderful. Highly recommend this resturant. Although it can get pricy, the food and experience is worth it. They also have a date night menu that looked very resonable. The nicest, most elegant restaurant that I’ve been to. Perfect to celebrate anniversaries or special occasions. Food is excellent, price is fair. My wife and I were most impressed. If you are a lobster lover, you MUST try the South African lobster! You'll have to save your pennies (ok, dollars!) but it is well worth it. I can't wait to go back! Worth the drive to San Diego. Great food and great service. The sea bass was excellent and the seafood appetizer platter delicious. Plan on spending some bucks, but a great place for those special occasions or business dinners. We discovered trulucks online and decided to give it a whirl. We were very pleased with e everything from the first step to th final bite of the key lime pie. Highly recommend It for those who love crab. My husband, who never orders crab, did so and still raves about it. Fresh will hurt your pocketbook, but it's worth it. Absolutelty the best restaurant on every level! Ambiance, service, entertainment, food, OH the FOOD! One of the best happy hours in town too. They also have the most extensive well arranged and well priced wine list. To celebrate our 24 wonderful years together, my wife and I dined at Truluck's. The service was impeccable, the food was well prepared and delicious and the wine selection was delightful. After dinner we repaired to the lounge and listened to the wonderful stylings of the live pianist. We left contented and with a warm glow having thouroughly enjoyed the evening. We will difinitely return and have recommended Truluck's to all our friends. The food, service, and atmosphere were outstanding! I also enjoyed the live music...great selection of songs! It was our 5 year anniversary and our waiter Andrew made our experience very enjoyable. We aslo got a very nice booth and received complimentary cake for our anniversary! My wife and I were very pleased we chose Truluck to spend our anniversary. My first experiance at this restaurant, and it turned out that my rating was one of my all time best right there with the Sardine Factory in Montery, truelly world class. Great food and great service. Wait staff is fantastic. My wife and I spent our 1 year wedding anniversary at Trulucks and had an amazing dining experience. The service was oustanding, the food was out of this world and our waiter Matthew was one of the best waiters we have ever had. We can't wait to come to Trulucks again. Trulucks has easily become our new favorite restaurant in San Diego. We went to truluck's for our anniversary and it was excellent. It was the best fish that we have ever had. We were there for restaurant week, so the place was packed. Even so the service and the food was perfect. It was my girlfriend,Belinda's birthday and I wanted to take her somewhere special to celebrate the occasion I read about Truluck's restaurant being the number 1 seafood dining establishment in San Diego and after our dining experience I must agree it was incredible! The ambiance, the food, the service, the presentation, the live music, everything was classy. It will cost you but if you love your lady and you want to impress her, it well worth it. Truluck's is king! I am here on businesss.. I went to the web to find a restaurant. Trulucks scored high on best in San Diego and it was right on the spot... I would visit here again.. The sangria was awesome too. The service and the food was excellent! We thoroughly enjoyed our experience there. My boyfriend surprised me with a nice dinner at Truluck's to celebrate my new job. I had never been there before and was pleasantly surprised. We loved the atmosphere and the live piano player completely set the mood. We had an awesome waiter, Danny Trahan, and the food was delicious! We aren't rich, so we don't go to places like Truluck's often, but we will definitely be back in the future. What a great evening! Going to this restaurant was one of the highlights of our trip to San Diego. Wonderful experience in every way. Definitely recommend it! Wanted to take my date to a nice place wasn't disapointed.Made reservation we got there a little early they took us rite in to great table..Service and food was excellent! Wanted to take my date to a nice place and wasn't disapointed. Made reservation, we got there a little early and they took us right to a great table..Service and food was excellent! From the moment we arrived the service was amazing The lighting and decor amazing, the food was also Delicious and I highly recommend this restaurant and will Visit here again for sure. I would have to say truthfully that My experience here was one of the best ever!!! Staff was excellent, food was outstanding and evening was memmorable. I will definately return when I visit San Diego again. Absolutely one of the best dining experiences we've ever had. Knowledgeable waiter whose timing when coming back to our table was perfect, great ambience, excellent food, friendly staff. The service and the food were outstanding. We would not hesitate to go back to make our way thru the rest of the menu. Thank you Truluck's! Excellent experience: nice place, great food and outstanding service!!! Celebrating the birthday in Truluck's was the best pick ever. The service, the food, the atmosphere, just everything was excellent. I would go there again for any other occasion! Had a perfect dinner and wonderful evening on Saturday, January 14. We were in Torrey Pines on business and made last minute reservations based on rankings on internet reviews. We shared several appetizers and the South African lobster...all excellent. Gina was friendly and perfectly professional and helpful with ordering. Our reservation was for 8:30 and we ran up against the closing of the kitchen. Gina very skillfully kept our meal flowing smoothly. And the live music was a big bonus; made the evening perfect! We happen to like American songbook as well as 50's to 60's and the wide range and smooth transitions from the likes of the Isley brothers to Cole Porter and Gershwin was more than we could have requested. Will definitely be back on next trip to SD. From the moment we walked into the restaurant your staff treated us as VIPs. The hostess quickly found our reservation led us to the bar to enjoy a few drinks and appetizer since we arrived 30 minutes early. The waitress in the bar was very informative and intuitive to our needs and handed us off to our table with no glitches and the waiter carried us through the dinner service from there. The food was sublime we each had a different crab for our entre and finished the meal with a desert. The food and service was exactly what you would come to expect and a little bit more. We will be returning to your restaurant for another evening very soon. Perfect Birthday dinner for a sea food lover. Best Lobster I had ever had. The South African lobster came with two large tails and the flavor was amazing. Everything else was really good but the lobster just blew me away. It was Market Price and the bill wasn't as bad as I was expecting and we had Champagne. So I loved it and I'm going back for the lobster!! Great as a NOLA restaurant! One of the best restaurant I've been to - and I've been to all the greats in New Orleans. The service, ambiance and quality are top-notch, but be prepared to pay. I met my co-workers for a celebratory drink on the patio and later met my date for dinner in the resturant. The service, food and drink were outstanding. Thanks Trulucks for making that night worth remembering! We went to Truluck for my husband's birthday. It was a first visit but it will not be our last. Excellent food, nice atmosphere and impeccable service. If you want to have a nice evening in a sea food restaurant in San Diego do not miss Truluck's. Service is great, sea food is excelent. Live jazz music is great. Try the king crab pawns. Oysters are perfect. Do not miss this place. The food was so good, so good that you find yourself thinking about the favors days later...how often does that happen? Amazing!! Truluck's was amazing. The food the service and the Live music amazing. be prepared to pay for this wonderful dining expereince. It's worth it! I was visiting San Diego and looked on-line for San Diego's top ten restaurants and found Truluck's. The restaurant was voted #1 and did not disappoint. The service was second to none and the food was to die for. I would not hesitate to recommend Truluck's for any occasion. We had made reservations here to celebrate our daughter's graduation from UCSD. Everything, starting from the ambiance, was excellent. Truluck's had come highly recommended and sure lived up to it. The food was really delicious, the service impeccable. Our daughter will be attending UCSD this fall from Louisville, Kentucky so we are trying to find some excellent restaurants in the area. I went on San Diego's Best Restaurants and found Trulucks. I reviewed the menu and knew that the family would enjoy the fresh seafood offerings. It is pricy but the food was excellent! Our server, Sammy helped make it a memorable evening....during dinner the manager stopped by to check on us..a very nice touch. Don't hesitate to go here as you will not be disappointed! Very relaxed, fun, yet upscale atmosphere. Will definitely go back. Amazing food and our waiter was great! Everything was really good and the service was really great! I read the reviews for this restaurant and thought we had to give it a try and it was worth it. The food is great but more importantly, the service was outstanding. I finally felt like the staff worked for their money and ensured that everything was perfect. My wife said Truluck's served the best lobster she's ever had! It's a restaurant you need to dine at for your palet's pleasure. Worth the drive to La Jolla. We were on vacation and have now been to San Diego, Santa Barbara and Napa and keep going back to Truluck's as the best meal of our trip and an overall great experience. From beginning to end. Wsh we lived closer so we could go back again/more often. They really care about providing a great meal and a great dining experience. Great food, amazing service, beautiful surroundings! We had the BEST meal we have EVER had at Truluck's! 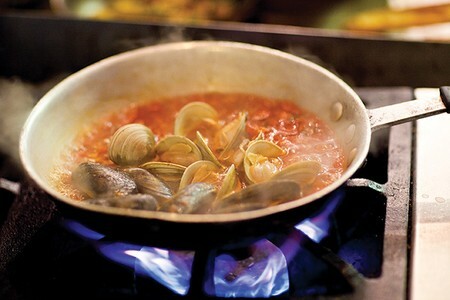 Make sure to try the scallops and the sea bass with Pontratrain sauce -- both of these dishes are incredible! Food, service and staff are outstanding! If you visit San Diego, you must visit Truluck's! We have never been here before, but when we walked in we knew it was a very fancy place. The food was absolutely incredible and the service we received was really great. Fantastic food for a very decent price. Cheers to Truluck's! I recently went to Truluck's with the plans of having dinner there. My husband noticed the restaurant had happy hour 4-7 pm daily and we decided to change our dinner plans to go to happy hour for 3 hours. It was a great experience. There were many selections of appetizers and drinks all half the regular price. We ordered 6 different appetizers which were all excellent. La Jolla Voodoo was an awesome drink. I would definitely come back, again for another date night with my husband. Best restaurant I have eaten at hands down. Ambiance was great and my girlfriend and I had a wonderful evening. Truluck's is certainly up there with the best of them. The ambiance, service and food was a perfect complement for a birthday dining experience. Our small group of four shared a booth and found the setting excellent for converstation. Service was outstanding - timely, informative and friendly. Really enjoined the place. The wife loved it. the Happy hour was great. Food was great. Drink Really good. This was the best dining experience we have had in the past several years. Now I can see why they won Best of the Best! Went to Truluck's to celebrate our friend's engagement in style and our expectations were surpassed. Our server Molly was fantastic throughout the entire meal. The medium crab claws were a huge hit and the "best" caeser salad hands down. Entrees were perect. Swordfish Pontchartrain, Ciopinno, Filet and New York Strip. Dessert was over the top with a slice of carrot cake that was enough for 6 people. Thank you to the folks at Truluck's La Jolla for the memorable experience. We will all be back soon. The waiter was excellent. Great service. Great food, except my asparagus was overcooked. All of the staff was very friendly and professional. I was there for a special birthday dinner, and the waiter brought out a special birthday dessert for my date. The individual french press coffee pots (for each person) was a very nice touch. Desserts were awesome...especially the carrot cake. Very nice place!